Solution: The vertical farm unit was successfully evaluated to identify the air flow across the vertical trays. It was observed that the flow remained almost uniform throughout the unit, except few bottom trays. Vertical farming is an innovative solution to cultivate plantation within a skyscraper greenhouse. However, in order to ensure sufficient air flow circulation along with artificial lighting, these units require effective placements of fans, air ducts and vents. 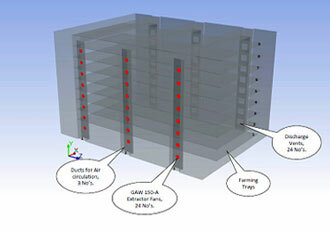 An Australian based vertical farming system provider needed simulation solution to predict the air flow pattern inside the ducts and trays, in order to measure the system’s effectiveness. A computational domain representing vertical farming unit was developed and suitable boundary conditions were applied. 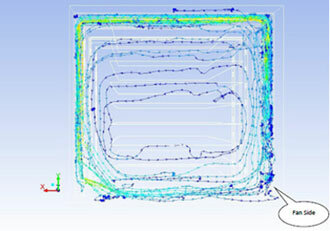 The simulation results showed that the air flow across the trays was uniform except three trays from the bottom. Recirculation zones were also observed which prevented top 5 discharge vents of the duct.